Alcatel Lucent Placement Papers PDF Download 2017-2018 | Aptitude, Reasoning & Verbal Ability Model Papers. 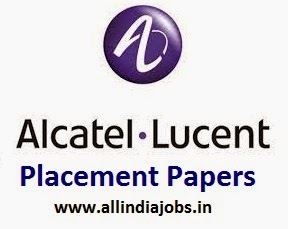 Dear aspirants are you in search of Alcatel Lucent Placement Papers? 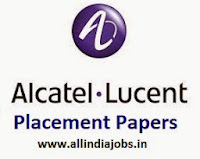 Find Alcatel Lucent Placement Papers, selection process and test pattern. Learn the questions asked in Aptitude, Reasoning & Verbal Ability. The series of sample questions provided below consists of questions based on Aptitude, Reasoning & Verbal Ability which have a good significance in Alcatel Lucent Placement Test. Know about the Alcatel Lucent Test Pattern followed in the placement test through this series. In this article, we have given information about Alcatel Lucent Placement Papers and syllabus. Placement in Alcatel Lucent highly depends on clearing the test on Quantitative Aptitude, English and Reasoning. Candidates who are going to appear for the Alcatel Lucent Recruitment Drive have to practice the Aptitude, Reasoning & Verbal Ability Model Papers to secure high marks in Alcatel Lucent Placement Test. Aspirants should practice the previous papers of Alcatel Lucent according to the syllabus by managing the time.This will help them to analyze in which area they are weak and have to spend more time to achieve their goal of clearing the written exam and further move to next rounds. Visit our website www.allindiajobs.in regularly for latest job opportunities, interview questions, study material and more. Enhance your chances of getting hired by Alcatel Lucent thorough their unique placement test. Answer some challenging questions on Quantitative Aptitude and see where you stand in Alcatel Lucent Placements. 1. Here are some words translated from an artificial language. moolokarn means blue sky, wilkospadi means bicycle race, moolowilko means blue bicycle. Which word could mean “race car”? 2. Which of the following directories contain all the files created by a user, including his login directory? 3. Using ODL, you can define which of the following? 4. Which command is used to list out all the hidden files along with the other files? 6. What is the similarity between a structure, union and enumeration? 10. Which is the valid declarations within an interface definition? Option A is correct. A public access modifier is acceptable. The method prototypes in an interface are all abstract by virtue of their declaration, and should not be declared abstract. Option B is wrong. The final modifier means that this method cannot be constructed in a subclass. A final method cannot be abstract. Option C is wrong. static is concerned with the class and not an instance. Option D is wrong. protected is not permitted when declaring a method of an interface. See information below. Member declarations in an interface disallow the use of some declaration modifiers; you cannot use transient, volatile, or synchronized in a member declaration in an interface. Also, you may not use the private and protected specifiers when declaring members of an interface. 12. In Ms-Dos what command you will use to display system date? 13. What function should be used to free the memory allocated by calloc()? B.In a record, there may not be a natural ordering in opposed to linear array. 15. Only file names and extensions are to be displayed in wide format, which command you’ll use? 16. Which of the following is not the required condition for binary search algorithm? 20. A is two years older than B who is twice as old as C. If the total of the ages of A, B and C be 27, the how old is B? Let C’s age be x years. Then, B’s age = 2x years. A’s age = (2x + 2) years. (2x + 2) + 2x + x = 27 5x = 25 x = 5. Hence, B’s age = 2x = 10 years. boolean -> true Which four options describe the correct default values for array elements of the types indicated? Using comma for separating thousand in file size is by default on. You can use dir/-c to remove comma from the listing. /C stands for comma. 23. How many buses are connected as part of the 8085 microprocessor? 24. If you need to duplicate the entire disk, which command will you use? 25. A train 240 m long passes a pole in 24 seconds. How long will it take to pass a platform 650 m long? Let their marks be (x + 9) and x. Then, x + 9 = 56/100= (x+ 9+ x) =25(x + 9) = 14(2x + 9) =3x = 99 =x = 33 So, their marks are 42 and 33. Alcatel Lucent Placement Paper on Reasoning Questions will be one of the rounds in the written test. Attempt as many questions as you can as it will be the prime decider of your career aspect of working with Alcatel Lucent. 1. Pointing to women in the picture, Rajiv said,”Her mother has only one grandchild whose mother is my wife, How is the woman in the picture related to Rajiv? Rajiv’s wife child, Rajiv’s child. The woman’s mother is the grand mother. Rajiv’s chils so the woman is rajiv’s wife. 3. In a class of 60, where boys are twice that of girls alaka is ranked. 17th from the top.If there are 9 boys ahead of alaka, than how many girls are after her in the rank? Therefore, Number of girls before alaka = 17-9-1=7. Cooperative social relationships contribute to develop individual potentialities. I. Every society desires to prosper. II. Individuals desire to develop their potential. III. It is possible to create and maintain a cooperative environment in a society. 5. Garima is taller than Sarita but not taller than Reena. Reena and Tanya are of the same height Garima is shorter than Anu. Amongst all the girl who is shortest? All the above indicate that Garima in either shorter than or equal in height to each of the girl except Sarita, while Sarita is shorter than Garima. Thus Sarita is the shortest. Today’s youth in India like western music more than Indian classical music. RI. Western music has strong base than Indian classical music. RII. Indian classical music is very boring and they like rocking music more. Hence the given assertion is about the preference of today’s youth. RI is talking about the strong base of western music. Having strong base does not imply that it is good to listen. RII tells that youth like rocking music but there is no evidence that western music is rocking.Neither RI nor RII is a reason. 8. In which of the following years was the imports made by company A exactly half of the total imports made by company B and C together in that year? 1992 only is the desired year. You don’t need any calculation. See the year where the point of A lies exactly in the middle of points of B and C.
The essential part of a cell is its nucleus.Not all cells produce chlorophyll (choice a). Not all cells are nerve cells (choice c). All living things, not just humans (choice d), have cells. Water is essential for swimming—without water, there is no swimming. The other choices are things that may or may not be present. Placement in Alcatel Lucent highly depends on clearing a test on Verbal Ability. Try some good questions from English Language and Usage to know how well are your chances of working with Alcatel Lucent. 1. —– dogs do not bite. 3. Are / you involved / in this project? / are you? 4. Every one is liable to make mistake? 5. In every field there is pressure to perform. —- After all in every failure there is a lesson to be learnt. (A) Parents and teachers should guard against putting unnecessary pressures on children. (B) But instead of succumbing to pressures one has to be motivated to perform better. (C) Failure is a stepping-stone to success. Statement A is not a direct continuation of the first sentence. Only B expresses an alternative for the idea expressed in the first sentence. And the second sentence explains statement B. Statement C is abrupt and does not present the flow of thought. 9. Although our country is self-sufficient in defence equipment, it is want in peace and security. Choice (A) is the correct substitute for the underlined part. The use of ‘although’ suggests that a word opposite in meaning to ‘self-sufficient’ has to be used in the second part. ‘Lacking’ is more apt. ‘Warning’ can also go. But in choice (D) ‘warning’ is followed by ‘to have’ which makes it ungrammatical. 12. My copy is as good or better than yours. ‘To be in stitches’ is an informal expression which is used when one is ‘laughing a lot’. 14. In every field there is pressure to perform. —- After all in every failure there is a lesson to be learnt. Statement A is not a direct continuation of the first sentence. Only B expresses an alternative for the idea expressed in the first sentence. And the second sentence explains statement B. Statement C is abrupt and does not present the flow of though. Dear readers, the syllabus and Alcatel Lucent placement papers provided here are just for information purpose only. Sometimes companies may change their syllabus and exam pattern. So Please check official company website for the latest syllabus.